More and more international students are coming to our university. We from ESN Witten/Herdecke want to help them integrate into university life. Our initiative was founded in 2013 under the name Witten International Network (WIN). By now, the team of ESN consists of students from all faculties. 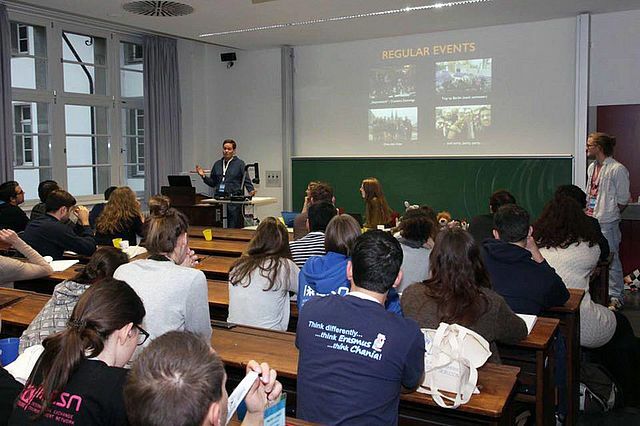 Since 2017, we are part of Erasmus Student Network Germany. ESN Germany is the consolidation of the German local Erasmus student initiatives. In 33 sections our voluntary members take care of approximately 10.000 exchange students every year. In Europe there are local ESN sections at more than 430 higher education facilities in 40 countries. This makes us one of the largest student initiatives in Europe. It is our mission to connect international students and local students here in Witten. International students may be here for their Erasmus semester, others from outside Europe are doing a semester abroad and some do their whole degree in Witten. Our aim is to make everyone feel welcome and integrating everyone. We want international visitors in Witten to leave with memories that will never be forgotten. In general, we address three different kinds of students with our activities. Support: We support international students before and after their arrival. This includes helping them to find a flat or a room and giving advice for their trip to Witten. We especially offer support in the first couple of days with things like cellphone contracts, bank accounts or other administrational tasks. Organize: Throughout the semester, we organize several activities for and with international students. This can be a cozy evening in a pub, a day-trip to another city or a study trip. All our events are public and everybody is always welcome! Connect: As a student initiative, we do not only take care of the international students, we also build bridges between international and German students. Our Buddy Program was developed to connect new international students directly with students currently living in Witten. Our country evenings also offer an excellent platform for cultural exchange to take place. Internationalise: We see ourselves as advocates of internationalisation at our university. We believe that making our university more accessible to international students will benefit all of us. We are constantly looking at areas for improvement work closely with the university community to ensure that change takes place. You are interested in our events? Just follow us on Facebook or subscribe for our mailing list. You want to be part of our team? Great! Just contact us and we will get in touch with you!